The spa and upscale dining experience is expected to rival other Las Vegas high rise projects. The signature restaurant at Trump Las Vegas will feature Joe Isidori. Isidori was the former personal chef to Trump and resident chef at Mar-a-Lago Palm Beach, Florida. The restaurant will be open for breakfast, lunch and dinner serving Modern American cuisine. The opulent lobby bar will serve a signature cocktail and a fantastic place to meet and mingle before those nights out on the Strip. Residents at Trump and hotel patrons can enjoy the casual poolside dining at H2(eau). The Spa at Trump Las Vegas features a health club with 1,500 square feet. Exercise equipment includes cardio machines with TV’s and equipment by Technogym. An outside open air heated pool at Trump is surrounded by a sun deck where you can enjoy a meal or two. The 10,000 square feet Spa at Trump will offer a relaxing and tranquil experience. The nine treatment rooms will offer products and spa treatments including those from Kate Somerville, a renowned skin expert. The luxury condominiums for sale in Trump Las Vegas are priced from $700,000 to over $7 million for this prestigious address. Tower II is expected to have ground breaking on its 1,280 rooms later this year. Call 702-505-6988 for VIP Las Vegas luxury condos representation by Las Vegas real estate agents. 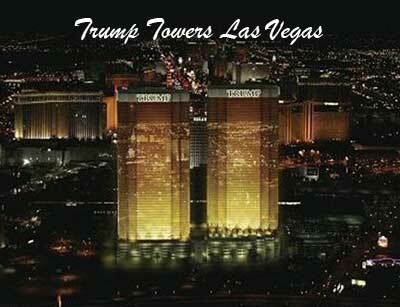 Trump Towers Las Vegas opens first tower with a bar, spa and restaurants.